The band takes the stage and blows through "Rockin' Around (With You)," the first song on its first album, from 1976. Petty ends the next few songs strumming in front of the drum set, trading man-crush smiles with drummer Steve Ferrone (Tench jokes, "They should get a room"). Petty even grins through a joyous version of "Walls," from 1996's She's the One, an album he's complained about for nearly 20 years. And then there's a flash of lightning. Rain pours down. The Heartbreakers are shooed into the catacombs of Red Rocks, and 9,000 fans head for cover. There's been a valedictory feel to the Heartbreakers' 40th-anniversary tour, which Petty says is the band's final country-spanning run­—the "last big one." Everyone else is a bit skeptical. 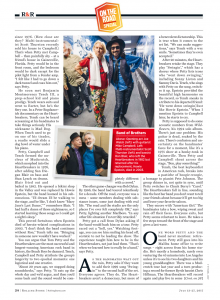 "I've been hearing that for 15 years," says guitarist and original Heartbreaker Mike Campbell. "We'll see." The crowds are still there, something Petty is clearly proud of when we sit down in a hotel room on an off day. To be honest, he looks more jittery offstage than on. This may be because he is chain-smoking, alternating between Marlboros and vaping, perhaps as a concession to the Denver Ritz-Carlton's smoking policy. The band now travels like pashas: playing shows in weeklong bursts, flying privately to the gig and then returning every night to a hub city like Denver. Backstage is no longer the den of iniquity it used to be, no longer full of starlets, hangers-on and good drugs. Petty says sleep is now his friend. "I need a new Netflix show, does anyone have any suggestions?" he asks just before his assistant ducks out of the room. Someone suggests Bloodline, a noirish series set in his native Florida. 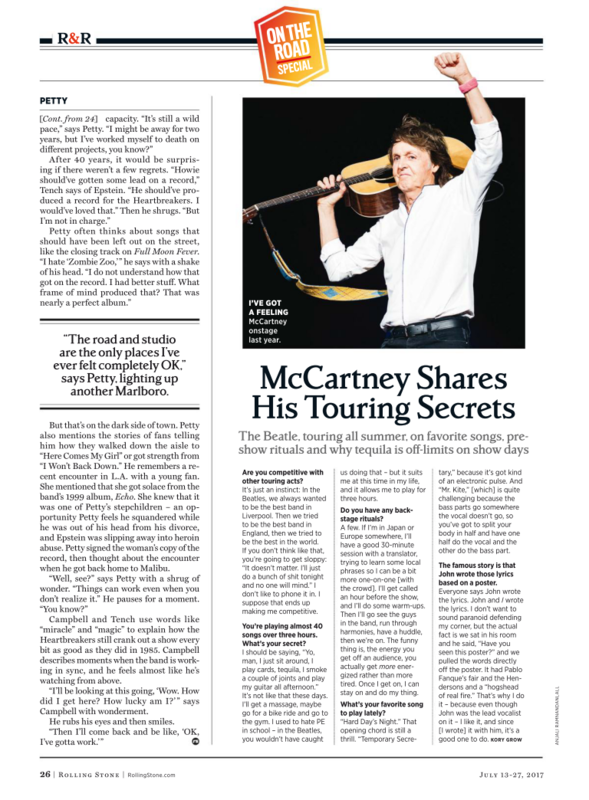 Petty is defiant about the hyper pace of the tour, which hits 30 cities this spring and summer. "Unless you've done it, you can't understand what it is," says Petty, brushing his scarecrow hair out of his face. "And if you're not really experienced, you will fall." What keeps the Heartbreakers together is simple: The band has been their life since 1976. (How close are they? Multi-instrumentalist Scott Thurston recently sold his house to Campbell.) That's when Petty met Campbell­—then painfully shy—at a friend's house in Gainesville, Florida. Petty would be in the front room, and the bedroom would be dark except for the pilot light from a Fender amp. "I felt like I had to go down a dark tunnel and coax him out," says Petty. He soon met Benjamin Montmorency Tench III, a prep-school kid and piano prodigy. Tench wears suits and went to Exeter, but he's the fiery one. In a Peter Bogdanovich documentary on the Heartbreakers, Tench can be heard screaming at his bandmates to take things seriously. His nickname is Mad Dog. When Tench used to go on one of his tirades, a roadie would slide a dog bowl of water under his piano. Petty, Campbell and Tench formed the nucleus of Mudcrutch, which morphed into the Heartbreakers in 1976, after adding San Diegan Blair on bass and Stan Lynch on drums. Blair fried out and bailed in 1982. He opened a bikini shop in the Valley and was replaced by Howie Epstein, but the band loomed in his subconscious. "I'd dream I'd be walking to the stage, and be like, 'I don't know "Mary Jane's Last Dance,"'" remembers Blair. 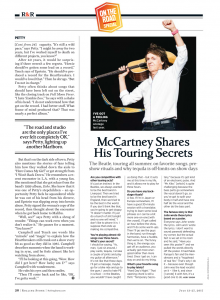 "I had half a dozen of those nightmares, so I started learning those songs so I could get a night's sleep." This proved fortuitous when Epstein died of heroin-related complications in 2003. "I don't think the band continues without Ron," Tench tells me. "Bringing in someone new wouldn't have worked." You can argue that Tom Petty and the Heartbreakers are the most successful and longest-running American rock band in history, the Beach Boys be damned. Tench, Campbell and Petty attribute the group's longevity to two epochal moments: one logistical and one creative. "About 20 years ago, we stopped doing soundchecks," says Petty. "It eats up the whole day and we'd argue, and then you'd come back and the sound would be completely different with a crowd." The other game-changer was Bob Dylan. By 1986, the band had toured relentlessly for a decade. Off the road, everyone was a mess—some members dealing with substance issues, some just dealing with real life. "The road and the studio are the only places I've ever felt completely OK," says Petty, lighting another Marlboro. "In any other life situation I'm terribly retarded." Petty got a call from Dylan asking if the band would back him on a tour. Petty raced out a "hell, yes." Watching footage, you can see him smiling his head off, ecstatic to not be leading the show. The experience taught him how to be in the Heartbreakers, not just lead them. "That's when we learned how to really be a band," says Petty. As the bandmates wait out the rain, Petty asks if they want to add their 1999 song "Swingin'" to the second half of the set. Everyone agrees: They do. The Heartbreakers aren't a democracy, but more of a benevolent dictatorship. This is true when it comes to the set list. "We can make suggestions," says Tench with a wry smile. "Sometimes they're even accepted." After 20 minutes, the Heartbreakers retake the stage. They play "Swingin'," which has a chorus where Petty lists icons who "went down swinging," including Sonny Liston and Sammy Davis. Tench, who sings with Petty on the song, switches it up. Epstein provided the beautiful high harmonies on the record, so Tench sneaks in a tribute to his departed friend: "He went down swingin'/Just like Howie Epstein." When I mention Epstein to Campbell later, he starts to cry. Petty is supposed to do some acoustic numbers from Wildflowers, his 1994 solo album. There's just one problem: His guitar is dead, soaked by the rain. There's confusion and uncertainty on the bandmates' faces for a moment, like it's a 1975 show at a honky-tonk in Gainesville. Then Petty and Campbell shout across the stage, "Ben, play something!" Tench, the best keyboardist in American rock, breaks into a pastiche of boogie-woogie, a homage to pianist Pete Johnson. The group chimes in, not quite in sync, until Petty switches to Chuck Berry's "Carol." The Heartbreakers fall in line, sounding like the best bar band you don't want to tell your friends about because it'll get too big and leave your favourite saloon. They encore with "American Girl." The bandmates take a bow, wiping sweat and rain off their faces. Everyone exits, but Petty seems reluctant to leave. He takes a few steps toward the front of the stage and gives a last wave. One word Petty and the band never mention: retirement. Petty still goes into his Malibu home office to write songs—right across from his home studio. He's mostly a homebody, rarely even venturing teh 45 minutes into Los Angeles unless it's to see his two daughters and his young granddaughter. There was a Mudcrutch tour last year and a turn producing a record for former Byrds bassist Chris Hillman. The Heartbreakers will record again and play live in some capacity. "It's still a wild pace," says Petty. "I might be away for two years, but I've worked myself to death on different projects, you know?" After 40 years, it would be surprising if there weren't a few regrets. "Howie should've gotten some lead on a record," Tench says of Epstein. "He should've produced a record for the Heartbreakers. I would've loved that." Then he shrugs. "But I'm not in charge." Petty often thinks about songs that should have been left out on the street, like the closing track on Full Moon Fever. "I hate 'Zombie Zoo,'" he says with a shake of his head. "I do not understand how that got on the record. I had better stuff. What frame of mind produced that? That was nearly a perfect album." But that's on the dark side of town. 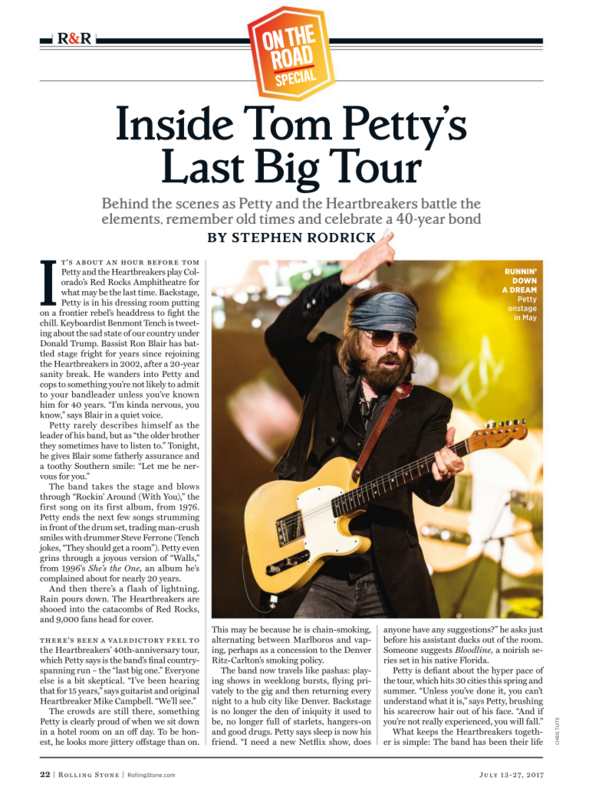 Petty also mentions the stories of fans telling him how they walked down the aisle to "Here Comes My Girl" or got strength from "I Won't Back Down." He remembers a recent encounter in L.A. with a young fan. She mentioned that she got solace from the band's 1999 album, Echo. She knew that it was one of Petty's stepchildren­—an opportunity Petty feels he squandered while he was out of his head from his divorce, and Epstein was slipping away into heroin abuse. Petty signed the woman's copy of the record, then thought about the encounter when he got back home to Malibu. "Well, see?" says Petty with a shrug of wonder. "Things can work even when you don't realize it." He pauses for a moment. "You know?" Campbell and Tench use words like "miracle" and "magic" to explain how the Heartbreakers still crank out a show every bit as good as they did in 1985. Campbell describes moments when the band is working in sync, and he feels almost like he's watching from above. "I'll be looking at this going, 'Wow. How did I get here? How lucky am I?'" says Campbell with wonderment. He rubs his eyes and then smiles. "Then I'll come back and be like, 'OK, I've gotta work.'"